Since summer in San Fran hasn’t exactly been full of sunshine lately, this week is the perfect time to check out two amazing exhibits currently on display at the Academy of Art University Galleries. Images from Tara Graves’ Tafoni Formations. Photos courtesy of AAU Galleries. Tara Graves is a San Francisco based landscape photographer who draws her inspiration from the natural environment of the Bay Area. Through the use of the unconventional cyanotype printing process, Graves explores and transforms this common, everyday subject matter into unexpected works of art that incite curiosity and inquisitiveness. Graves’ first solo exhibition, Tafoni Formations, investigates the minute details of granular rocks, which often occur in groups, shrouding a hillside or cliff. 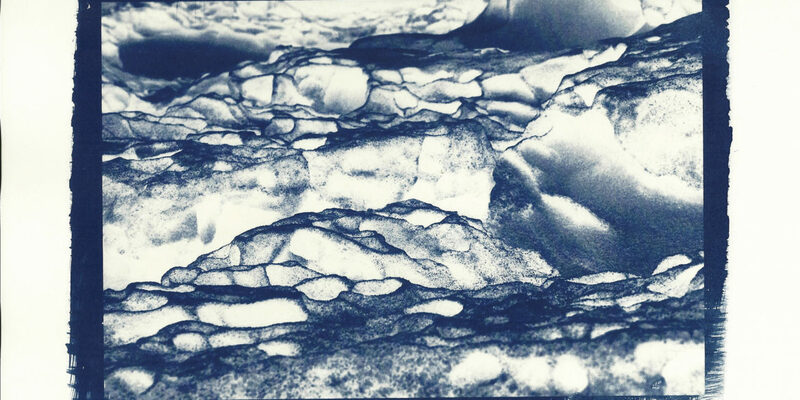 Graves’ adept understanding of cyanotype printing allows her to capture the natural forms of the tafoni, while creating the illusion of an aquatic landscape in these thought provoking prints. Images from Steven Stodor’s Regatta. Photos courtesy of AAU Galleries. For his 2013 solo exhibition, Steven Stodor experiments in abstraction, drawing inspiration from his life by the water. Using imagery of nautical flags and silhouettes, Regatta presents an alternative view of this life. His subject matter is brought to life through the use of a vibrant palette, a harmonious balance between organic and geometric forms, and a distinct impasto. Stodor moved to San Francisco in 2002, and has exhibited throughout the city since 2004. Stodor’s interest in abstract oil painting was fostered during his time studying at the Academy of Art University, where he graduated in the Spring of 2013 with a Bachelor’s Degree in Fine Art, Painting. Both exhibitions will be on display only until July 28th so be sure not to miss them! For more information, visit www.aaugalleries.com.